Perceived Quality has become more valuable to manufacturing as OEM’s begin to understand that the perception of their vehicles’ quality is almost as important as the quality of their vehicles. Companies are even rated on their Perceived Quality and compared to their competition as a means of determining brand quality (ALG Spring 2012 Perceived Quality Study, (http://www.autonews.com/assets/PDF/CA79774530.PDF). Perceived Quality has understandably then been given greater and greater attention by manufacturers. Based on the presentation given at CATIA Creative Design and ICEM Conference by Dassault Systemes and DCS Partner Hitex, This whitepaper focuses on using high-end visualization in the 3DEXPERIENCE Platform (CATIALive Rendering) as part of the engineering process to help determine build objectives and improve the Perceived Quality of products. Perceived Quality is the quality attributed to a product based on its perceptual experience. This incorporates the experience a customer has with a product and how it makes them feel about the product. Bringing together the shape, the appearance, the texture and physical feel of the product as well as the emotional experience of using the product, Perceived Quality directly affects the customer’s opinion of the value of the product. This perceived value then drives the business. 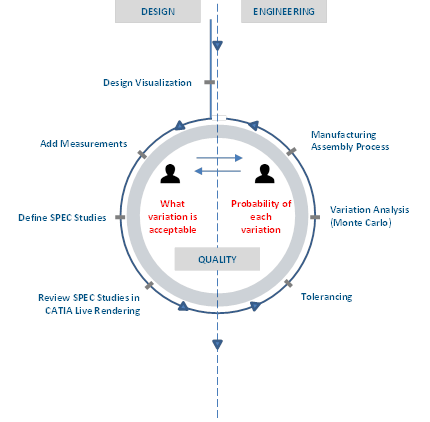 How Do 3DCS and CATIA Promote Perceived Quality? Together, 3DCS and the CATIA 3DEXPERIENCE give users the ability to create life-like studies of their products incorporating both manufacturing and objective variation. These studies guide engineers in the process of creating GD&T, and give a means of communicating manufacturing information between design and engineering using a feedback loop to meet both design and engineering build objectives. This paper outlines how Spec Studies can be used to support this process, and then takes you step by step on how Spec Studies are created, used and shared in the CATIA 3DEXPERIENCE environment. Using videos and graphics, this whitepaper is an excellent way to see how Perceived Quality can benefit your organization. What Value Does Perceived Quality Studies Give to an Organization? How Does the Design Team Apply Perceived Quality in CATIA 3DEXPERIENCE? How Does the Engineering Team Use This Information? The first stages of the process begin in the design studio. The design team drives the tolerancing process by creating the Spec Studies, the visualization studies of gap and flush conditions set at specific values to determine acceptable levels of variation.